Sometimes it's where you drink the beer, who you're with, and what the general mood of the day might be. Sometimes, the beer is good, no matter WHERE you drink it, who you're with, or how you feel. Case in point? Ladyface Alehouse. Part French Brasserie, Part Ramona Romance, the charm of the place is hard to ignore. It's on the way home from my favorite surf spot. I don't stop in often, but when I do, it seems that the beer always tastes amazing. Is that because I've just been playing in the sea and the sand? (I used to love to play this Who song from Quadriphenia on my guitar). Is it when I'm with my friend, the elusive Eleanor? When I was just a cub craft beer reporter, I interviewed Ladyface head brewer Dave Griffiths. I was pretty impressed. But what did I know? “Dérailleur” is a special bière-de-garde (“beer for keeping”), brewed to celebrate the global passion for cycling. Named after a bicycle’s gear-changing mechanism, this ale is malty, smooth with tart apple and pear notes that come from aging in French Sauvignon Blanc barrels from Malibu’s Semler Vineyards. This a deep golden ale is balanced with a noticeable earthy hop character. Here's a link to what I wrote about DERAILLEUR a year ago, without ever having tasted it. I have a feeling this year's version was more hop-forward, in the new Cali-Belgique style. My friend's local pub is at the Russian River Brewery. Their Pliny the Elder beer tops most of the world's beer rankings. And yet, I liked Derailleur so much better that day. How to explain it? This past weekend (September 18, 2011), I found myself at Zuma again on a beautiful day. 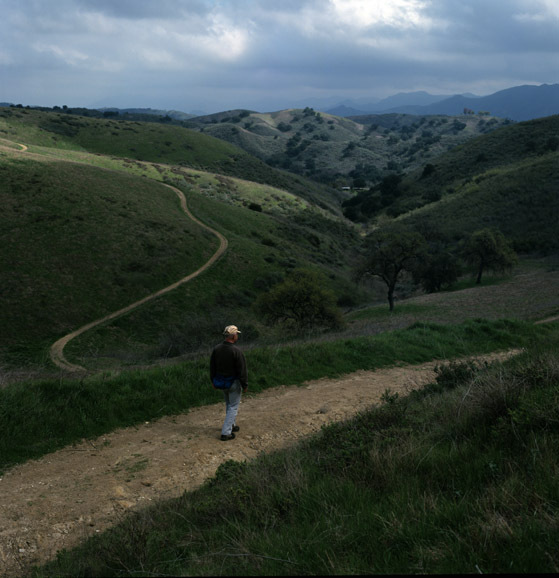 The surf was so-so, but the skies were blue, hawks were hovering, a breeze was blowing, and at Ladyface on the way home, I was seated across from Eleanor, looking up at Ladyface peak. The sun set as we sipped our suds. Unfortunately, Dave's Cask of the Week, Last Mango in Paris, had tapped out. So we ordered the seasonal brews Red Rye and Palo Comado instead. According to our server, Joe, Palo Comado XPA ("Extra Pale Ale") is named after a nearby trail and was made with hops grown over the hill in Malibu. Eleanor's more discerning palate first picked up a "nori" or seaweed note, which yielded, during our second pint, to a distinctly raspberry overtone. A check of the Ladyface website the next day revealed that hemp seeds were one of Dave's artisanal additions to Palo Comado, and they gave the brew a nutty character. 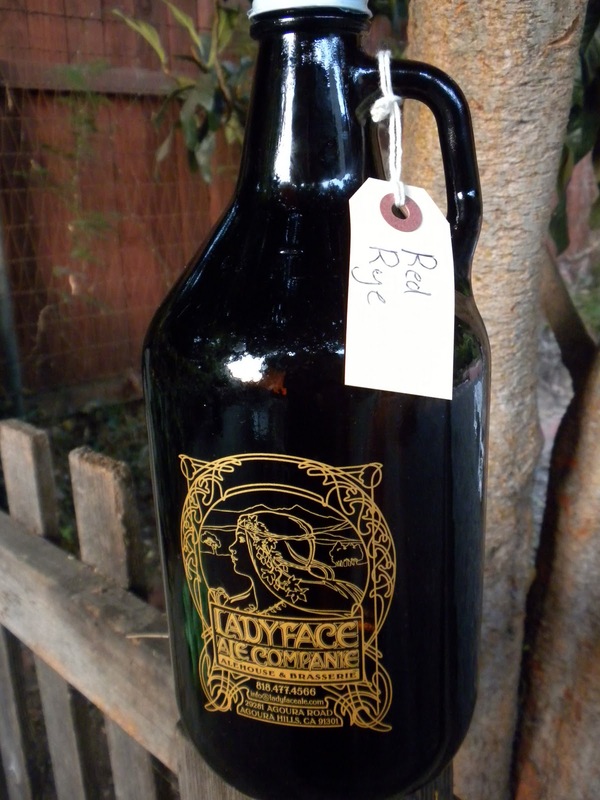 The Red Rye was SO good, that I brought a growler of it home. The perfect transition from summer to fall: hoppy, like an IPA of summer, yet deeply copper in color, like the autumn to come. At home, the following evening, after a frustrating day in the world of working for a living, no waves, no hawks, no beautiful Malibu, the Red Rye STILL tasted awesome. Therefore, I declare that objectively speaking, it is a world class beer. Comments and detractors welcome. Yay! You're back. I like the way you put things. Love all the links.